I think that you need to be in the loop about following exchange of emails on the captioned matter. Therefore, I am forwarding it for your perusal. First, this is to intimate ADB (including NRM in Kathmandu) that I am releasing the attached letter for two reasons. One, Mr. Hitchcock has not indicated that I shouldn’t do so. Two, I have been alleged, by a reporter of Kantipur, to have been “lying to the Nepalese people about the Melamchi and Tariff” when I thanked ADB “for reconfirming that the news report of ADB having written to GoN on 28th December last year to pressurizing it to raise water tariff, saying that it is the pre-condition for ADB's support for Melamchi Diversion Tunnel (MDT), is incorrect. This must be a figment of imagination of the reporter. It indeed isn't befitting a national daily of that level. I think that it is incumbent upon ADB to officially repudiate the false report.” You will note that I didn't say that the report is a figment of imagination of the reporter, rather what I am said was "this must be a figment of imagination of the reporter" in the backdrop of the attached letter. I am sure people are able to understand the nuance. 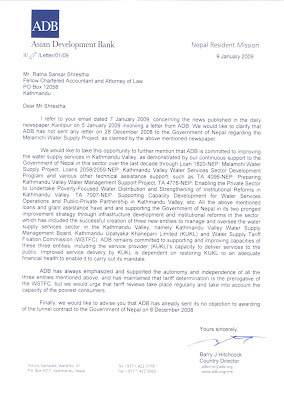 In the attached letter, ADB has indeed confirmed that it “has not sent any letter on 28 December 2008 to the Government of Nepal regarding the Melamchi Water Supply Project, as claimed by the above mentioned newspaper.” From this it is clear who is lying and who isn’t. If the letter being referred to by the newspaper exists then the veracity of the attached letter will be questionable, on the basis of which I have written following email and vice versa and, therefore, it is not a case of whether the undersigned is lying or not. However, I don’t want to stoop to such a level and get embroiled in a discussion about who is lying and who isn't. The letter, sent to me by ADB, is very clear, though. As I said in my previous email, it is high time for ADB to officially state what is correct and what is not. The vernacular daily in discussion has been harping that “no objection certificate” for tunnel contract for Melamchi will be sent by ADB only upon implementation of tariff revision. However, in the attached letter, Mr. Hitchcock has confirmed that ADB has already sent its “no objection to awarding of the tunnel contract to the Government of Nepal on 8 December 2008” – a long time before the reported letter of 28th December – intended to pressurize GoN to increase the tariff – was supposedly written. The reporter has also insinuated that I am an ADB official. I challenge him to prove it and I request ADB officials in Nepal and abroad to provide him necessary assistance for the purpose. It is the matter of great surprise that Ratna Sansar Shrestha, the member of Tariff Fixation Commission and Seniour Water Resources Analyst (and ADB's officials ? are lying to the Nepalese people about the Melamchi and Tariff. For your proof please see the letter by Hun Kim, Director, Urban Development Division, South Asia Department, dated 19 Nov 2008 to Secretary of Ministry of Physical Planning and Works. What has written in that letter are : ".. We sould like to highlight that the tariff revision is one of the key loan covenants, non-compliance of which may kick in consequential suspension procedures pursuant to the loang agreement." ........... "ADB's no objection letter for the tunnel contract will be sent to the Government as soon as we receive your written confirmation to implement the agreed tariff revision." So, without knowing facts and figures please don't write this "This must be a figment of imagination of the reporter. It indeed isn't befitting a national daily of that level." We reporter never write the NEWS, imaging. So, it shows how Ratna Sansar is making poeple dupe. Thanks a lot for sparing time from your busy schedule and reverting back to me. I also thank you for reconfirming that the news report of ADB having written to GoN on 28th December last year to pressurizing it to raise water tariff, saying that it is the pre-condition for ADB's support for Melamchi Diversion Tunnel (MDT), is incorrect. This must be a figment of imagination of the reporter. It indeed isn't befitting a national daily of that level. I think that it is incumbent upon ADB to officially repudiate the false report. Although I am not in a position to speak officially on behalf of the Commission (nor the utilities), I, in the capacity of a member of the Commission, thank you for reaffirming that ADB supports autonomy and independence of the Commission. You are absolutely right that the tariff determination is the prerogative of the Commission, which will not withhold any tariff revision unduly if the utility is able to substantiate the need of a tariff revision for the sustainable operation of the utility. Being a student of economics I firmly believe in sustainable operation of any enterprise. That, however, is not the case with the present tariff review proposal. The day the utility will prove that it needs to resort to the tariff increase for its sustainable operation, the tariff proposal will be approved without any undue delay. You will agree with me that the sustainable operation of the utility can be ensured by undertaking various reform measures (and the foreign management team was engaged for that very purpose by deeming that Nepali management was found wanting in this respect) before having to increase the tariff. Therefore, the utility should first undertake, plan to undertake reform measures (come up with time bound proposal for the same) like leakage control, reduction of payment default, etc. before anticipating any tariff increase. In other words, the utility should propose a tariff increase that will become absolutely necessary which couldn't be met with the increase in revenue and/or decrease in expenditure by undertaking various reform measures. I appreciate your clarifying that ADB has already sent no objection letter for awarding tunneling contract by a letter dated December 8, 2008.I am sure that you won't have any objection in my making this letter from you public. In response to your email of 7 January 2009, attached is a letter signed by the Country Director, Nepal Resident Mission for your information. This is to intimate you that I have sent following email to ADB country director for Nepal and I am forwarding the same for your kind perusal. I hope you will arrange necessary action such that autonomy and independence of a newly instituted regulatory commission for water supply in Nepal (set up at the initiative of ADB) is neither undermined nor impaired. Although I cannot speak on behalf of other members of the commission, however I can hazard to assure you that the commission will make a fair and reasonable decision about the tariff escalation in due course, provided that the utility also takes necessary initiative to reform the institution such that a big escalation in the tariff is not necessitated as being proposed by the utility currently which could create law and order problem in Nepal already on very much unstable. Besides, ADB is being portrayed as a bully here in Nepal. I would like to believe that that is not the case. I hope you will instruct your staff to take corrective measure. From the news published on the captioned matter in the vernacular daily – “Kantipur” – on 5th January 2009 I have learnt that ADB has written a letter to GoN re tariff increase being pre-condition for ADB’s support for Melamchi Diversion Tunnel (MDT), dated 28th December. In other words ADB is holding the construction works of MDT to ransom to fulfill its covenant related to tariff increase. I am unable to believe this story as it does sounds outrageous. Also, because when we met you last week, you didn’t refer to any such letter to us at all. If one is to lend credence to the news, by the time we met last week the said letter had already been written. If that is the case then you didn’t indicate about it to us. But I am unable to believe that an institution like ADB will be part of anything as such. Moreover, it has been reported to me that someone in ADB has been going around claiming that the Water Supply Tariff Fixation Commission exists because of ADB and if that is true then it is more unlikely that ADB would write such a letter because this action both undermines and impairs the independence of the Commission as the decision regarding tariff is in the purview of the Commission and pressurizing GoN for the purpose doesn’t make sense. Let’s look at it from another perspective. Multilaterals in Nepal have been recommending and implementing “foreign management” as the best panacea for improvement of public enterprises which languish due to political (and otherwise) interference and for such institutions being unable to function independently and autonomously. In this backdrop it is unthinkable that ADB will take any deliberate action as such to undermine and impair the independence and autonomy of the Commission. Therefore, I hope that the news-story is a fig of imagination of the reporter. The reporter further goes on to portray the two of the three members of the commission as anti-Melamchi. I am sure that ADB didn’t feed this to the reporter. I have no information on involvement of the other two members in the debate related to Melamchi. However, the undersigned has been actively campaigning to solve the water supply problem for the longer term (2 m3/s of water will not be adequate when this project will be completed and the rampant scarcity will persist and as it took 30 years, hopefully, to take off the first stage, it will take quite a while for the second and third stage to leave the drawing board) and also resolve electricity crisis to an extent by generating hydropower (no financial obligation on GoN and ADB for the purpose) by using the same tunnel for multipurpose Melamchi which will also benefit farmers in Terai as water in the dry season will become available to irrigate 30,000 ha in Terai without any additional investment. This definitely doesn’t make me anti-Melamchi. Although the experiment of the World Bank with foreign management in two prominent banks, in the name of financial sector reform, has failed very badly (after spending Rs 7 billion and 6 years), at the insistence of ADB the water utility management of Kathmandu valley has been entrusted to a foreign management team. In a period of less than a year, the new management has submitted 3 (one informal and 2 formal) proposals for the escalation of water tariff to the Commission. As ADB’s name has been linked with the water tariff increase it is worthwhile to look at the issue a little closely. Nobody in the right mind will disagree that any enterprise, including a utility, needs to be operated sustainably. However, as water supply is an essential service and it touches upon the lives of the poor and deprived segment of the society, a utility as such should not be too focused on tariff increase in isolation as long as there are other ways of achieving the sustainability. In other words, increase of tariff should be resorted to only after all avenues for sustainable operation of the utility have been exhausted. In this respect the utility is in a position to implement various measures to operate it economically, efficiently and effectively before resorting to tariff increase. Besides, the only ground cited for tariff increase is the inflation over last 4 years. However, the utility is ignoring the increase in its consumers by 15% over the same period due to which the consumers have been effectively forced to pay at a higher rate (pay same amount for dwindling volume of water) as the volume of water supplied by it has not changed since 2004. I am sure you will agree that a tariff increase is like a bitter pill which needs to be sweetened by improving the services of the utility. Otherwise, the consumers could rise against the measure thus deteriorating the law and order situation already standing at the precipice. Therefore, it makes no sense to take up the issue of tariff increase in isolation and stake the reputation of an institution like ADB.